There are several ways to connect to your MongoDB instance. programmatic access through a number of programming APIs. 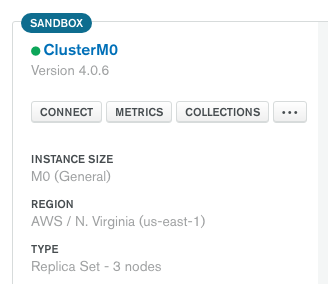 The following guide steps you through installing the MongoDB client of your choice. 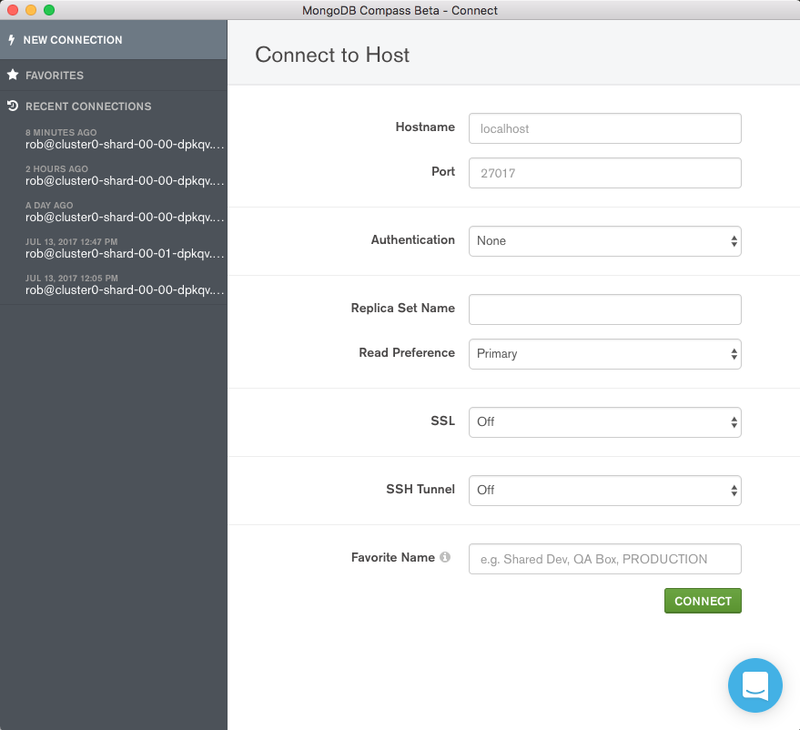 Install MongoDB and start up an instance to which you will connect. Ensure that your client platform is compatible with MongoDB. Refer to the Supported Platforms table for more information. Select the client and environment you will use at the top of this page. The mongo shell is packaged with the MongoDB Server Community and Enterprise distributions, and is also available for users of Atlas as a client-only download. MongoDB binaries are located in a directory that starts with “mongodb-“. You should see a file named mongo, which is the shell executable. If you do not have mongo shell installed, follow the install directions for your environment. If you do not already have a mongo shell, you can download just the shell by logging into Atlas. For your cluster, click Connect. Under Check the IP Whitelist, add the IP address of the client you wish to have connecting to Atlas. Then click the Connect with the Mongo Shell. Follow the instructions in the dialog to download and install the shell. Download the latest stable version for your environment. After downloading, click on the downloaded .msi file. The Windows Installer will guide you through the installation. Double click the tgz file to untar the file. Extract the tar file and locate the mongo executable under the bin directory of your install root. To install Pymongo, see the Pymongo documentation. package github.com/mongodb/mongo-go-driver: no Go files in (...). If you are using Compass, skip this step. In order to connect to MongoDB, you will need a URI string. A URI (Uniform Resource Identifier) is similar to a URL, and is supplied as a parameter to the mongo shell, Compass, and the MongoDB drivers when connecting to a MongoDB deployment. You can create a URI string for your session in MongoDB Guides by copying and pasting your Atlas connection string in the form below. Once you copy the string here, any relevant code examples within the MongoDB Guides will be populated with a URI string. If you have not already retrieved your Atlas connection string, see Set Up Atlas Connectivity guide. The URI string used in the guides assumes you have set up authentication for your MongoDB instance, and have created a username and password for read and write access to a MongoDB database. If you have already set up a user with the readWriteAnyDatabase role through the Enable Authentication on MongoDB guide, you may use that username and password here, along with the admin database in your connection string. The URI form below allows you to create a URI string for your session in MongoDB Guides by filling out a form. Once you fill out the form, any relevant code examples within the MongoDB Guides will be populated with a URI string. You can change these at any time by repopulating the form. If your connection string contains $[password], you will need to replace this string with your password. Use caution where you store and enter passwords, particularly when running from a shell or command prompt. Special characters in passwords must be escaped. Have you whitelisted your IP address for access to Atlas? For more details see Step 3, Whitelist your IP Address and Select Your Connection Method in Set Up Atlas Connectivity. Select the operating system platform on which you are running the MongoDB client you have selected. Pass the URI to the mongo shell followed by the --password option. You will then be prompted for your password. If you wish to manually configure your Compass connection, load Compass and select the New Connection link. You will see a form where you can enter connection information for MongoDB. Atlas users can copy a URI string from the Atlas console into Compass. 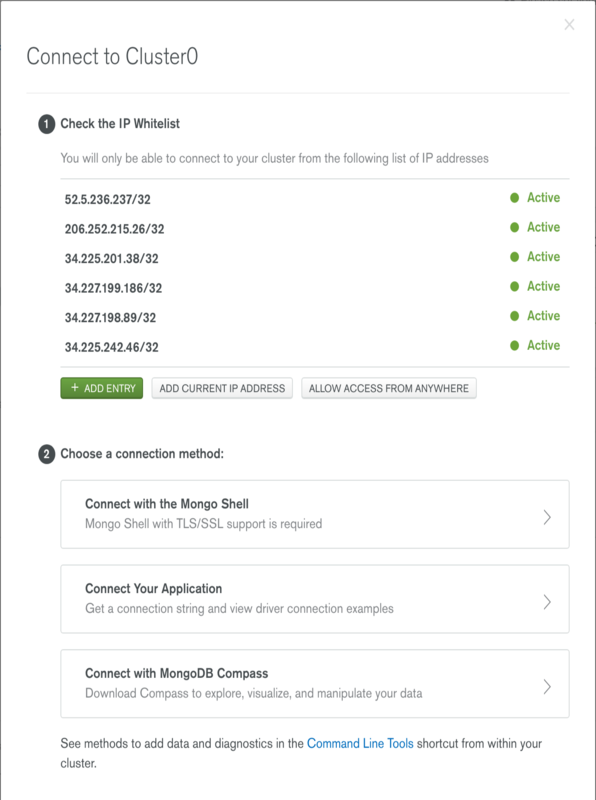 MongoDB Compass can detect whether you have a MongoDB URI connection string in your system clipboard and auto- populate the connection dialog from the URI. See Set Up Atlas Connectivity for information on how to get the Atlas connection string URI into your copy buffer. If Compass was already running when you copied the URI string, click the NEW CONNECTION button. You will be prompted to populate the connection dialog. Click Yes. You should then populate the password field with the proper password for your MongoDB user in the connection form. Errors related to connecting through Compass will appear in red at the top of the Connect screen. It’s a good idea to put your connection code in a class so that it can be reused. Now add code to call the class you just created. For the MongoDB java driver 3.7 and beyond, use the MongoClients.create() method. The MongoDB.Bson package is used in CRUD operations, so you’ll import it here. Replace your password and any parameters surrounded by $ in the connection string in the code below. For now, you will use the context.TODO(). Later you’ll configure the context specific to your requirements. You won’t know if the connection has been successful until you use the connection. A ping is one way you can test the connection. This is a full example of a Go connection to mongoDB, including a test ping. In your Go workspace and project folder, run build. Now run the binary. For binaries that are not installed, you’ll have to specify the path. If you’d like to run the resulting binary without specifying a path, install the binary you just built into your Go workspace. Now run the code. “yourprojectname” is the name of the project directory that contains the file with your main() function. For binaries that are not installed, you’ll have to specify the path. Congratulations. If you have successfully completed this guide, you have connected to your MongoDB instance. In the next group of guides, you’ll learn how to create, read, update, and delete data in MongoDB. In the next guide, you’ll learn how to insert data into MongoDB.